I believe LinkedIn and Facebook are the two platforms every Small Business owner should be utilizing. 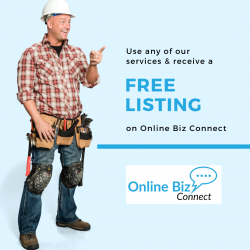 You may not get any leads or sales from LinkedIn and the same can be said for Facebook however you are building both your personal and business brand. While some may find LinkedIn to be their primary source for leads others may find that Facebook is for them. I regularly share to LinkedIn and it’s usually when I’m doing all my posts for Facebook. 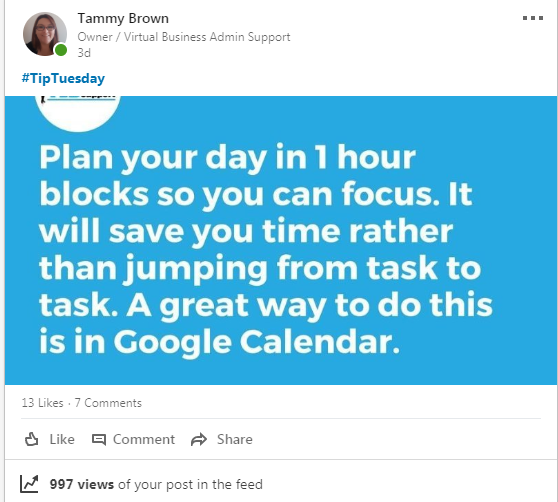 I try to stick with a theme like #TipTuesday and #ThrowbackThursday, well this Tuesday just passed I shared a tip on LinkedIn and I’m shocked at the engagement that I got for such a simple post. This was the post. It started by one of my connections liking and commenting on the post, then 2 more connections and then the rest are connections of theirs that have liked, commented or viewed the post. So from Tuesday I’ve received 13 likes and 7 comments and nearly 1000 views. This is just from sharing regular valuable content that people resonate with. If you’re not familiar with LinkedIn you get updates weekly that tell you how many people have viewed your profile. This week I’m up to 36 views of mine. That means that there are 36 potential leads that I have obviously caught their attention enough that they viewed my profile to find out more about what I do. As any business owner who wants to succeed you need to find what works and jump on board. Both Facebook and LinkedIn are great platforms that you should be using but Facebook I feel is more relaxed has more of a causal vibe to it as opposed to LinkedIn which I call the ‘Professional Facebook’. So have you got a LinkedIn profile?